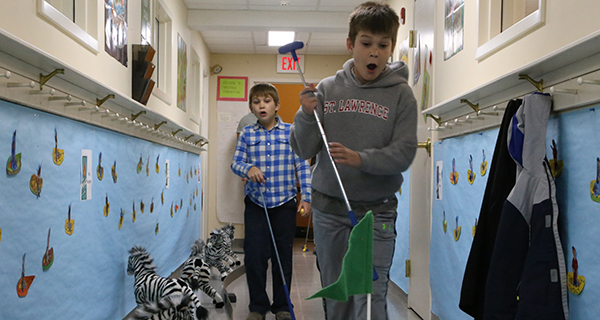 Members of the greater Dover community enjoyed eighteen holes of indoor mini golf at St. Dunstan’s Church this past Friday. The event was the church’s first event of 2019 in an ongoing series called Dover Unplugged, aimed at bringing families and the community together in a device free setting. 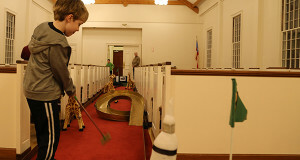 As parents and children made their way to hole 1 in the basement of the church, they were met by a truly spectacular sight: weaving through rooms, down halls, between pews, under chairs and down stairs, 18 eclectic holes of mini golf snaked their way throughout the entire church. Competitors teed off from a faux-grass tee box, driving colorful golf balls down a wood, tile or carpet fairway – whatever the floor happened to be made of in that room. The tall legs of stuffed giraffes and zebras proved hazards along the way, as did clanging tambourines, Apollo rocket ships, and long gutters with narrow openings that needed to be threaded precisely to launch the ball to the cup. The holes were assembled by a company called Library Mini Golf, whose name is perfectly reflective of its specialty: building miniature golf courses in libraries. It is a niche business, perhaps, but one that is in a remarkable amount of demand. “I do it all over the country. Mostly libraries, lots of universities, but sometimes synagogues and churches like this. To have a job where you get to see kids have fun, it’s just great,” said Russ Bolton, co-owner of the company and assembler of the course on the evening. Bolton knew what he was talking about, too, as fun was certainly had. Balls bounced down stairs while kids bounded after. Prizes were awarded for hole-in-ones. 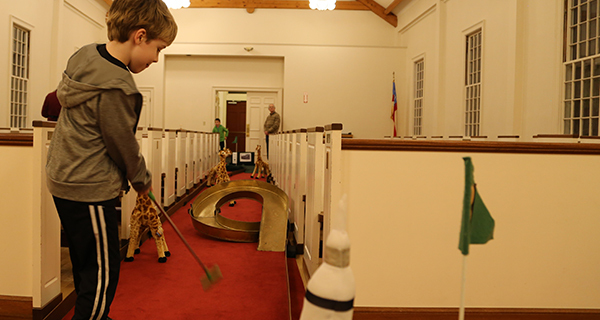 Kids, parents and grandparents alike could be found swinging putters and slinging smiles everywhere you turned in the church. Visit www.saintdunstansma.org for a complete calendar of upcoming Dover Unplugged events.